I keep getting told that being a ‘real Londonder’ is a rare thing, but I am in fact a real one. I was born and bred in London but am ashamed to say there are keep spots I am yet to visit. Therefore a couple of weeks back, blessed with some surprisingly good weather and equipped with a Samsung S7 Edge (which 3Mobile kindly lent me), I headed to Borough Market to tick off exploring an area which has been on my to-do list for a while. I was surprised by the size and variety at Borough Market, theres grocery produce, delicious cooked food, cakes, flowers and more! We headed down there for lunch, shared some calamari and then had a pork sandwich, naughty but so tasty! We also picked up some doughnuts from Bread Ahead bakery which everyone recommended and were really delicious! I can’t wait to go back, try some more food and take my mum who I think will love it. It’s a great way to spend a sunny day in London! 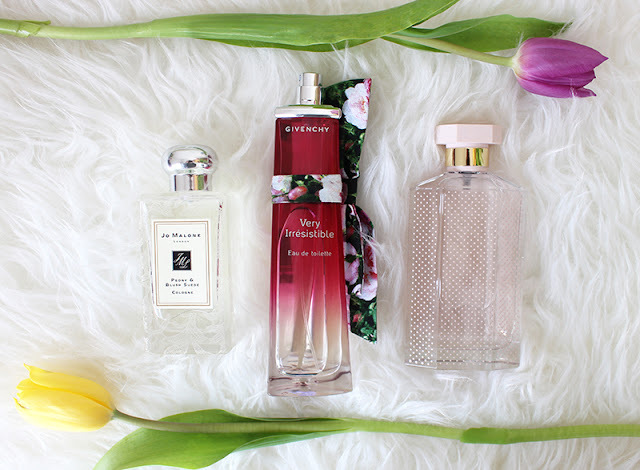 I shared my blog post with all my favourites scents for the spring a few months back but I couldn’t help but share some more which have just arrived. Embarrassingly I managed to lose the lid to Givenchy Very Irresistible Mes Envies but it was probably the one I was most excited to get my hands on. 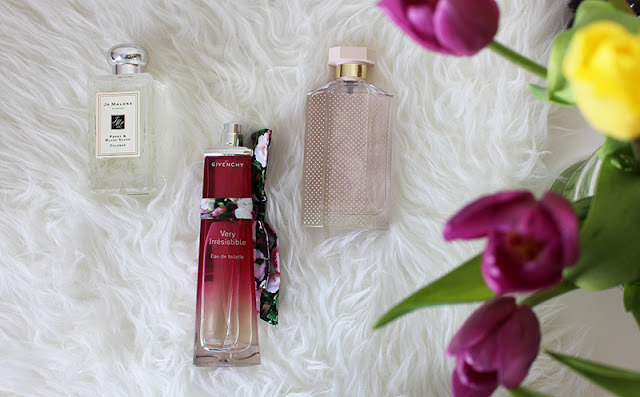 Years ago the original Very Irresistible was my favourite fragrance and even now I can totally see why, it really is beautiful! As you an guess from the floral bow this scent is Rose and Peony based, it does have some sort of citrusy top note but I am useless at working out exactly what it is. If you’ve owned Very Irresistible in the past then I think you’ll really like this, it’s similar but a little more up-to-date version and if you’re just looking for a pretty floral scent which really works all year round then this is one you should consider. New from Jo Malone is their Bridal Lace Bottle Collection which is available in their ten most loved scent. If you are getting married I think checking out these bottles is an absolute must (and the Jo Malone Wedding Service for help to chose the right fragrance for you) but even if you aren’t getting married these are beautiful collectors bottles. I have Peony & Blush Suede which wears really beautifully, once again quite a floral scent but I get so many compliments when I wear this from everyone although I find it gets better as the day goes on. Finally another revamp of a favourite is the Stella McCartney Eau De Toilette which I don’t find to be quite as nice as the Eau De Parfum but is a fresher more day time appropriate fragrance. It’s a mixture of Rose and Citrus scents, I’m sure any lover of the original would also love this one, great perfume for spring/summer. I think this will probably be the day time fragrance I take on holiday with me in July. I received another fragrance yesterday which arrived to late for this post but it is amazing and I will share with you very soon! The weather in London has been getting better over the last month and we have had some truly beautiful days so it’s a great time to indulge in a lazy Sunday pamper and take care of things that sometime get forgotten in the winter, in order to really make the most out of the spring weather. Although I know some people are religious with hair removal all year around, I am a little more relaxed with it in the winter. If you fall in the same category as me that it’s the best place to start so that you ready to get your legs and arms out. I recently discovered the Veet Spawax Stripless Wax Warming Kit which makes at home waxing pretty easy but I often just go with a Gillette Razor. I also like to spend some extra time scrubbing, buffing and moisturising my skin to remove any old skin as well as really insert life and hydration back in. Since I fake tan year round I actually do exfoliate quite often but often don’t moisturise head to toe but it really does make a huge difference, I’ve been reaching for The Body Shop Fuji Green Tea which also smells amazing. I’ve also been wearing sandals lately so like to pay extra attention to my feet and give them a mini at home pedicure. If you’re a fake tanner like me than adding an extra light layer can make the world of difference, it makes me look thinner, more glowy and I just love looking sunkissed. My favourites have been Bondi Sands Tanning Lotion and the Clarins Radiance Plus which I have been using on my face and body. How have you updated you pamper routine for spring?